Friends in social networks, as in real life, are the people you trust enough to tell them things you wouldn’t share with others out there. 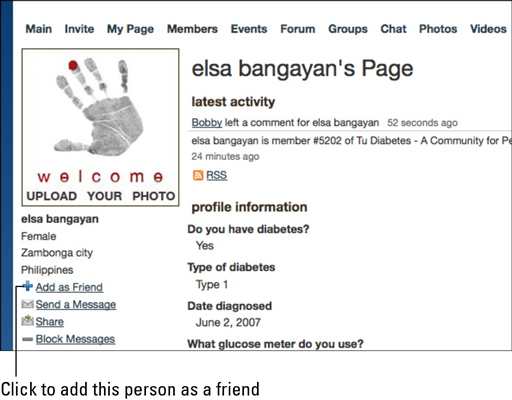 You can add friends to your Ning account and accept friendship requests that come to you from others. Click the profile photo of any member, anywhere on the network. The person’s profile page opens. 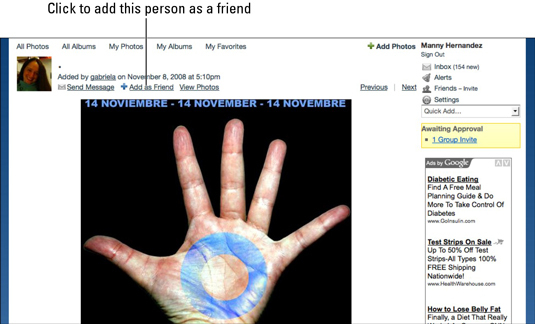 Below the person’s image at the top left, click the Add as Friend link. This request then goes to the person, and he or she can accept or ignore it. Click the Add as Friend link above any discussion topic, blog post, photo, or video posted by another member. This figure shows an example of how this link looks in the case of a photo. It looks exactly the same way with videos, discussion topics, and blog posts. Go to the Members page, and then click the Advanced Member Search link next to the Search Members button. The page that appears gives you the option to select among a number of parameters directly related to members’ answers to the profile questions during sign-up. Enter the information you wish to search for in the Advanced Member Search page. You can enter as much information as you want. The results of your search appears. Your My Friends page opens. Whenever you need to get to your My Friends page, click the Friends link in the top-right section of the network. To accept the friend request, click the Accept button. The member is added to your Friends list. To decline the request, click the Ignore button. The person won’t be notified, so you don’t have to worry about that.